We were sad to leave our lovely accommodation in the High Country of North Carolina and we set off for a new adventure in a new state. But we still couldn’t get enough of the Blue Ridge Parkway, and took a slight detour to the Linn Cove Viaduct, supposedly a spectacular architectural marvel completing the final construction of the Parkway, and also boasting breathtaking views. But the fog settled in almost immediately after we arrived, and the views from the Viaduct were as spectacular as if we were surrounding in nothing but white space. The gorgeous Linn Cove Viaduct. An Emperor's New Clothes Experience! Disappointed, we headed back north, through the Volunteer State of Tennessee, and into Virginia, also called “The Old Dominion”. Traditionally, we would always find a location to visit to break the long journey (this trip took 5 hours in total drive time). However, because of our wifi problems over the past few days, we were unable to find a place that was open by the time we arrived, or one that was not too much of a detour from our destination. The state's latest campaign - an attempt to inject more romance perhaps? But the boys were hungry, so we stopped by the roadside for lunch - it turned out to be a pleasant spot in the Virginia countryside, and the boys no doubt attracted many passing cars as they decided to wave and salute to many of those who drove by. Our little spot in the Virginia countryside. No place to sit? Our boys will always find a way! The littler one made himself useful when the local mailman came by and asked him to help deliver the mail. We eventually took a break in the small charming town of Buchanan, and stopped by the Buchanan Fountain and Grille. This is an iconic place which takes one back to 1950s’ America with its tiled floors and booth seats. The original fountain, which used to dispense soda, is gone, but what thrilled the boys was the juke box, which spun old-fashioned records of tunes from the past. A blast from the past. 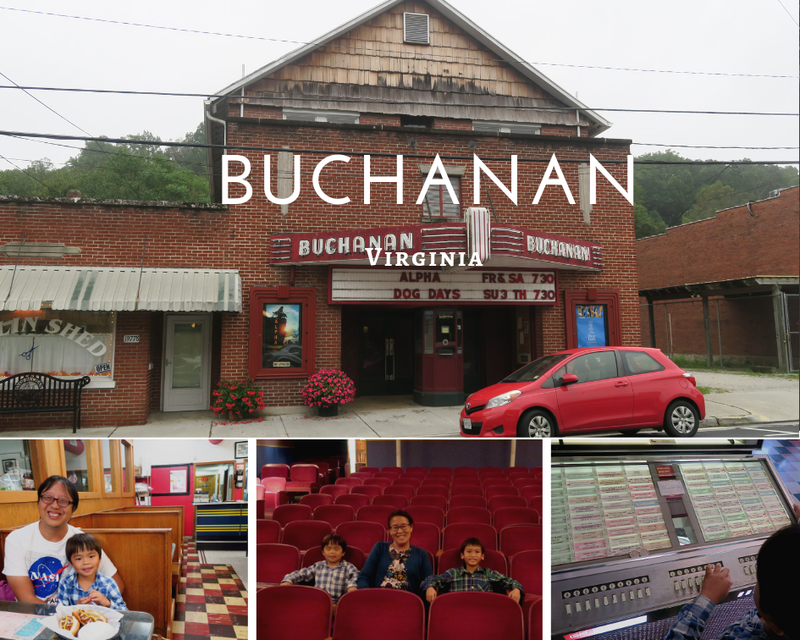 Step into 1950s' America here in Buchanan. Mesmerised by the old-fashioned jukebox which still churns out records at a quarter a tune. We also stopped by the Buchanan Theater, which was opened in 1919 and still screens movies today. Run by a non-profit organisation, the Theater was renovated in 2002 and the community wanted it to remain “just the way things were”, and so a group of volunteers now run the shows and the place has become a gathering point for the town. can still watch shows for US$4 a screening. First dips. Enjoying popcorn from a traditional giant popcorn machine. Buchanan is known for its Swinging Bridge, the only one of its type to cross the James River. The bridge was burnt down by the Confederates in a bid to stop the Union troops from crossing the river, and was rebuilt after the Civil War. It was truly spectacular to see elements of history come alive at almost every part of our trip! The iconic Swinging Bridge. Spectacular views of the James River. We resumed our journey and reached our lovely new accommodation nestled in the Shenandoah Mountains. We can’t wait to start exploring the area, but that would have to wait - after a bowl of soup and a good night’s rest. The Previous Page - How Towns Are Created. Read here. What's Next? Of Bushels & Pecks: An Adventure with Apples. Read here.